From aircrafts and manufacturing plants, Honeywell is a Fortune 100 company which provides a variety of products and services for a diverse range of customers right around the world. And when it comes to portable air conditioners, the brand is on the up in Australia. 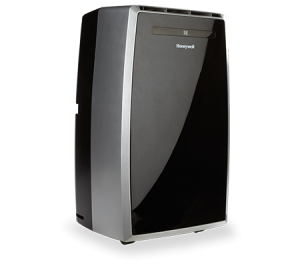 The Honeywell range is designed for people who want a compact and easy-to-install and easy-to-use portable air conditioner. Each model also features the brand’s own unique evaporation system, which is said to filter, dehumidify and cool air. This is said to remove the need to constantly drain water trays, as well as offer a more environmentally friendly solution to keeping cool. Available in a range of styles, some models include the Honeywell MM14CHCS, Honeywell MN12CES, Honeywell MF09CESWW, Honeywell MN10CESWW, Honeywell 14CCS, and Honeywell MN12CESWW. These products come with a 1.2m hose, which apparently directs the heat outside and removes the need for a drainage tank. The accessories kit also includes an adjustable window bracket. But does Honeywell hit the sweet spot when it comes to portable air conditioners? To help you decide, we’ve compiled a list of some of the models currently available and their prices. Are you looking for a jack-of-all-trades? It might be worth considering the 4-in-1 Honeywell MM14CHCS Portable Air Conditioner – it boasts cooling, fan, dehumidification and heating features. The Honeywell MM14CHCS has a 4.1kW cooling capacity, which is said to comfortably cool spaces up to around 51m2. For warmth, the air conditioner similarly has a 3.51kW built-in heat pump claimed to heat up to 37m2. The model also includes a built-in dehumidifier to take away up to 44L in 24 hours. For shoppers searching for an eco-friendly portable air conditioner, the Honeywell MM14CHCS is stated to use R410A refrigerant and contains a 24-hour energy saving programmable timer. If you’re not a fan of the heater function, the Honeywell 14CCS is a suitable alternative. For a portable air conditioner that’s easy to move around, the Honeywell MN12CES includes four caster wheels and is said to ensure a climate-controlled environment. The 3-in-1 model features a variety of functions including cooling, fan and dehumidification. It also contains a new no-drip technology which uses an auto-evaporation system. This apparently ensures the appliance can continue to operate for hours without requiring you to empty a water tray. The model similarly includes a washable air filter which doesn’t need to be replaced. The Honeywell MN12CES contains a 3.51kW cooling capacity. Similar to other models from the brand, this unit includes a built-in dehumidifier claimed to eliminate up to 40.8L of humidity per day. 24-hour energy saving programmable timer. The Honeywell MN12CES is available in black-silver design. 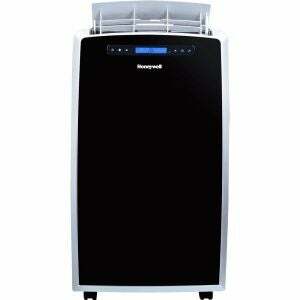 Alternatively, the Honeywell MN12CESBB Portable Air Conditioner features an all-black style. If you’re short on space, you may want to consider the Honeywell MF09CESWW unit as your next cool companion. This model has a 2.3kW cooling capacity and is suitable for rooms up to 27.8m2. The 3-in-1 unit offers various functions including cooling, fan and dehumidification. 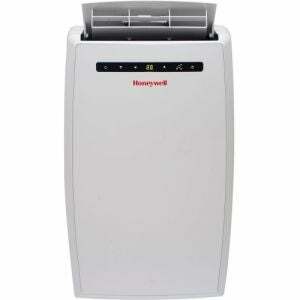 For particularly humid days, the Honeywell MF09CESWW is said to simultaneously cool the room and remove humidity. The MF09CESWW is available in white. But you can alternatively buy the Honeywell MN10CESWW in a black design. Sometimes finding the perfect portable air conditioner in-store is the easy part. But it’s the process of setting up the appliance that can turn anyone into a hot mess. Thankfully, the Honeywell MN12CESWW Portable Air Conditioner is apparently easy to install. 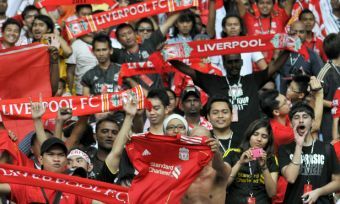 It’s also claimed to be an ideal solution to coping with the most humid days. The dehumidifier can remove up to 38.4L of moisture per day. 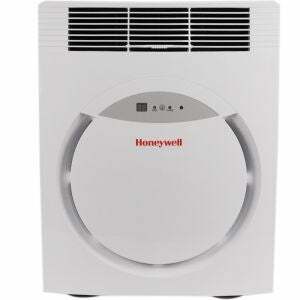 The Honeywell MN12CESWW has a 2.9kW cooling capacity and could be ideal for studio apartments. The Honeywell MN10CESWW is alternatively available for people shopping for smaller spaces. This has a 2.9kW cooling capacity and is said to be suitable for rooms around 37m2. Should I buy a Honeywell air conditioner? From easy installation to low noise levels, Honeywell’s portable air conditioners feature a number of convenient functions, designed to create minimal hassle on days when it’s just too hot. Some of the options available include the Honeywell MM14CHCS, Honeywell MN12CES, Honeywell MF09CESWW, Honeywell MN10CESWW, Honeywell 14CCS, and Honeywell MN12CESWW. The brand also claims to be environmentally conscious and uses what is claimed to be an ‘eco-friendly and non-ozone depleting refrigerant’. The R410A refrigerant compressor, condenser and evaporator is said to automatically evaporate moisture and hot air. This is then directed outside using either a hot air discharge hose or exhaust hose. Honeywell’s system is different to what is included in certain products from other brands which empty water into buckets that often need to be regularly drained. If you’re shopping for a small room, products like the Honeywell MN12CESWW offers a 2.9kW cooling capacity and includes many of the same features found in Honeywell’s pricier models. Otherwise, you can always consider purchasing more powerful air conditioners such as the Honeywell MM14CHCS and Honeywell MN12CES. Stop sweating over finding the right portable air conditioner. Compare a wide range of cool products and brands with Canstar Blue. Rinnai has proven to be a popular choice in our customer satisfaction ratings, achieving solid reviews for categories such as reliability, functionality and noise. Other brands have similarly proven to perform well overall, including Kogan, DeLonghi, Convair and Dimplex.